The concept of inertia spawned Galileo’s concept of relativity: the sensory and empirical equivalence of the uniform rectilinear velocities of terrestrial bodies and the accelerated motions that occur on them. As we learned in Chapter 4, the magnitudes of force, mass and acceleration vary in such a way (covariantly) that Newton’s second law remains empirically the same (invariant) on all inertial bodies. Galileo’s concept of relativity has been modified many times and in many ways. Nevertheless, Galileo’s relativity (in any form) is only a simplistic and intuitive convention of convenience, and not a fundamental law of nature. In Aristotle’s theory of the cosmos, the Earth was at rest at the center, and the Sun, Moon, planets, and stars all rotated around the stationary Earth once each day (Figure 2.1A). Aristotle attempted to justify his theory that the Earth was stationary in space with the following rationalization. When a rock is allowed to fall to the ground from a tall tower, it is observed to land at the foot of the tower. If the Earth was moving through space while the rock was falling, then it should land in a much different place (Gamow, 1961, pp. 42 – 43). On the other hand, in the 16th century, Nicolas Copernicus theorized that the Sun was at the center of the Cosmos, and that the Earth, Moon and planets all rotated around it (Figure 2.1B). This heliocentric concept was completely at odds with Aristotle’s theory and Christian dogma, and it was vehemently opposed by the Catholic Church. In 1632, Galileo wrote a book that supported the Copernican theory, entitled Dialogues on the Two Great World Systems (French, p. 67). In his book, Galileo argued that “the vertical path of a falling object does not compel one to the conclusion that the earth is stationary” (Ibid). He gave, by way of analogy, the example of a rock dropped from the top of the mast of a ship. Whether the ship is at rest or moving with a constant velocity, the rock always lands just at the foot of the mast. Thus an observation of the point of impact on a deck reveals nothing of the ship’s state of motion” (French, p. 67; Figure 5.1). By analogy to the above empirical experiment, Galileo argued that the point of impact on the Earth of the rock that falls from a tower reveals nothing of the Earth’s state of motion. “[S]o long as the vessel stands still [the motions of material objects take place in a normal manner. Then make the ship move with what velocity you please, so long as the motion is uniform and not fluctuating in this way and that. You shall not be able to discern the least alteration in all the forenamed effects, nor can you gather by any of them whether the ship moves or stands still…” (Galileo, Dialogues, 1632 [Gamow, 1961, p. 45]). Ergo being on a body that exhibits uniform rectilinear motion, or observing accelerated motions on such body, reveals nothing of the state of motion of such body (i.e. Earth). Why is this true? Because all observers and all other material object on any body with any uniform rectilinear velocity empirically have exactly the same experience…a sensory illusion of rest. This concept of the sensory equivalence (relativity) of all uniform rectilinear terrestrial motions, and the empirical equivalence of all accelerated motions which occurs on them, is sometimes referred to as Galileo’s principle of relativity. Galileo’s Relativity demonstrated that all uniform rectilinear velocities of terrestrial bodies (including the Earth itself) are equivalent states of motion with respect to any mechanical events that occur on such bodies (Figure 5.2). This concept of mechanical relativity is nothing new. Everyone since the dawn of civilization has experienced this same phenomenon of empirical equivalence (relativity) (Bird, p. 51). But Galileo was possibly the first person to specifically describe it. The distance (vt) that the ship traveled from the port did not matter, nor did the magnitude of its uniform velocity (v). The only thing that mattered was that in each position of the ship (in dock or sailing away from the dock) the velocity of the ship was uniform and rectilinear (Ibid; Figure 5.3). 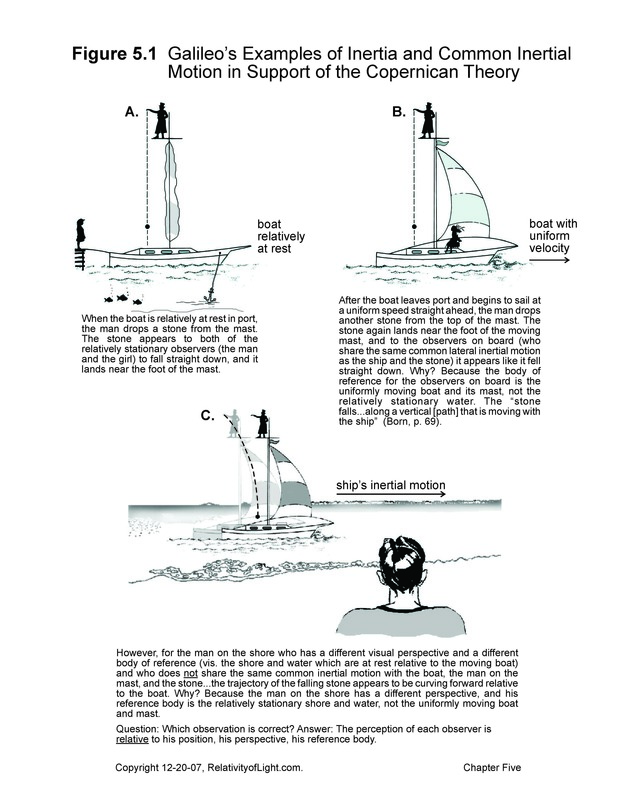 Galileo’s example also demonstrated that such uniform rectilinear velocities may either be “inertial” (without applied force, like we perceive the motion of the Earth through space to be); or it can result from the application of a force (like the wind uniformly pushing the sailing ship forward). Therefore, Galileo’s concept of the empirical equivalence (or the “relativity”) of uniform velocities is not really dependent upon the concept of inertia…uniform rectilinear motion without applied force. Why is Galileo’s concept of relativity true? Because the uniform motion of the ship is common to the observers and the other material objects relatively at rest on it. In other words, the ship and its contents all experience the same common uniform velocity. 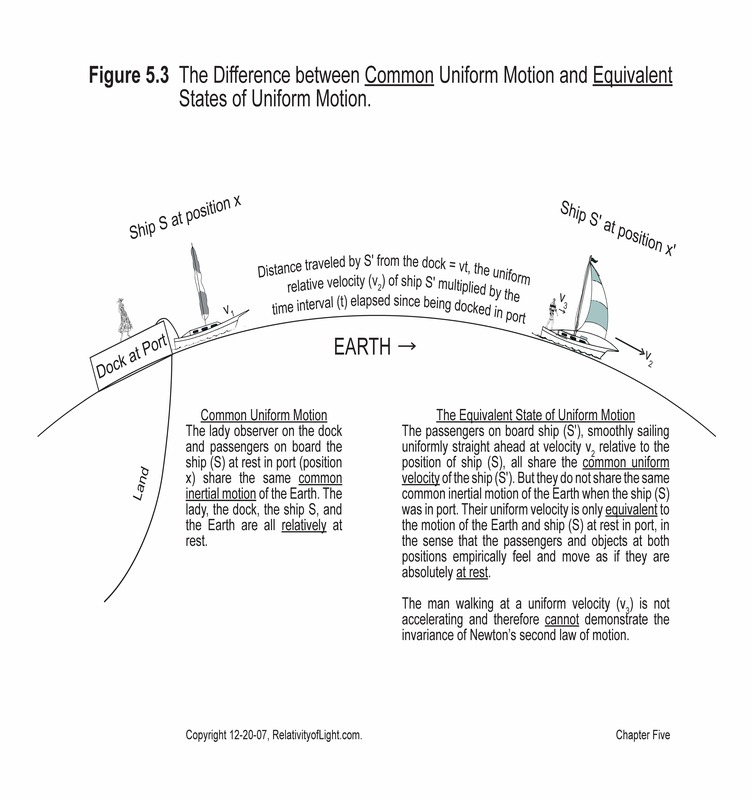 Empirically, the motions of such material objects are the same as when the uniformly moving ship was lying in the harbor at rest relative to the Earth’s surface (Figures 5.2A and 5.2C). The different magnitudes of uniform velocity of two moving bodies (the Earth and the ship) are not sensed or perceived by an observer or by any other material object in either situation. All that is perceived by an observer in both equivalent situations is a sensory illusion of rest. Again, the observer and his material objects have exactly the same experience in both situations of perceived rest. 2. The (covariant) accelerated motions of terrestrial objects on such inertially moving bodies demonstrate the “invariance” of Newton’s second law of motion with respect to different inertial velocities. Without both concepts, there is no principle of Galileo’s Relativity. One might ask at this point: What relevance or importance does Galileo’s sensory and empirical concept of relativity have with respect to Einstein’s Special Theory of Relativity? The answer is that Einstein adopted a very different mathematical variation of Galileo’s Relativity (which we shall call “Galilean translational relativity’) as the basic mathematical framework for his Special Theory, and he needed to characterize this very different mathematical variation as merely an extension of Galileo’s Relativity so that his ad hoc mathematical Special Theory might appear to have some semblance of an empirical foundation (see Chapters 13, 14, and 24). This subterfuge by Einstein was an attempt to disguise the fact that his mathematical Special Theory had no empirical foundation at all and was in fact totally ad hoc. “The motions of bodies included in a given space are the same among themselves, whether that space is at rest, or moves uniformly forward in a right [straight] line…A clear proof of this we have from the experiment of a ship; where all motions happen after the same manner, whether the ship is at rest, or carried uniformly forwards in a right [straight] line” (Newton, Principia [Motte, Vol. 1, p. 21]). Very importantly, Newton left out inter alia the sensory illusion of rest which is perceived by the inertial observer, so that he cannot determine whether he is moving or not. During the 18th and 19th centuries, the above empirical concept described by Newton would be transformed by his mathematically oriented followers (often referred to as “Newtonians”) into two mathematical concepts: “covariance” and “invariance” (Chapter 4). Simply stated, the magnitudes of the variables of Newton’s second law of motion (F = ma) would vary in such a way (“covariantly”) on all terrestrial bodies with equivalent states of uniform velocity, so as to leave the algebraic form of Newton’s second law (F = ma) mathematically unchanged (“invariant”) on each inertially moving body. Restated in abstract mathematical terms, Newton’s second law operated “covariantly” in all inertial frames so as to retain the same invariant algebraic form (F = ma) in any inertially moving frame (Resnick, 1968, p. 11). This mathematical equivalence of every uniformly and rectilinearly moving frame on the Earth for the same algebraic operation of Newton’s laws of mechanics, regardless of such frame’s different magnitude of uniform velocity, is sometimes misdescribed as “Galilean Relativity.” Because the term “Galilean Relativity” refers to the abstract and algebraic operation and equivalence of Newton’s laws of mechanics rather than the sensory or empirical operation and equivalence thereof, it is a very different concept than Galileo’s original concept of relativity (Chapters 13 and 14). After Newton published his three laws of motion in 1687, many mechanical experiments and applications of his laws were conducted, and they empirically confirmed the validity of such laws. After multitudes of such experiences, and countless observations and measurements, it finally became obvious that Newton’s laws of mechanics empirically held true to a high degree of accuracy. This was the case no matter at what place on the inertially moving Earth they were applied. There never was a question that Newton’s second law of motion (F = ma) worked the same way and did not change its algebraic form where the uniform velocity of the terrestrial laboratory was common to the inertial motion of the Earth, such as two different acceleration experiments conducted at different locations on the surface of the inertially moving Earth. As Galileo stated in 1632, “no man doubts that, so long as the vessel stands still [on the surface of the Earth, such accelerated motions of objects] ought to take place in [the normal] manner” (Galileo, Dialogues, 1632 [Gamow, 1961, p. 45]). The only possible remaining question was: does Newton’s second law of motion work the same way, and does it retain the same algebraic form on two different uniformly moving bodies where the different uniform rectilinear velocities are only equivalent (Figure 5.3)? Thus, by the early 18th century, the only possible purpose of Galileo’s Relativity was to theoretically demonstrate the equivalence (empirical “covariance”) of accelerated motions on two different and spatially separated uniformly moving bodies, and thus to theoretically demonstrate the empirical “invariance” of Newton’s second law of motion on all equivalent terrestrial frames with different uniform velocities anywhere on the planet (Figures 5.2A and 5.2C). By the latter part of the 18th century, there was no doubt that Newton’s laws of mechanics were empirically and theoretically invariant and that terrestrial principle of Galileo’s Relativity was valid on any uniformly moving terrestrial body. Therefore…“the principle of relativity, so far as it concerned mechanical phenomena, grew into general acceptance” (Bird, p. 53). For these reasons, there was no point to continue demonstrating the theoretical and empirical covariance and invariance of Newton’s laws of motion or the validity of Galileo’s principle of relativity…empirically, sensorally, theoretically, mathematically, or otherwise. Thus, for most of the 19th century, the concept of Galileo’s Relativity in any form was all but forgotten. As previously mentioned, notably omitted from Newton’s above description of relativity was Galileo’s specific statement that an observer located in an enclosed cabin on such ship cannot sensorally detect from the uniform motion of the ship, nor empirically detect from the accelerated motions of bodies in the cabin at either time “whether the ship moves or stands still.” However, during the latter part of the 19th century, it was theorized that if stationary ether existed, then light experiments conducted on inertial bodies (i.e. Earth) should be able to detect the absolute velocity of the Earth relative to the theoretically stationary ether. At this point, the Newtonians belatedly adopted Galileo’s statement (concerning sensory and empirical detection), which was omitted by Newton, and modified it into a mathematical test for the existence of the fictitious ether and the absolute motion of material bodies through the ether. They then asserted that no mechanical experiment conducted in the cabin of the ship would allow any observer to sense or empirically detect any difference in the two equivalent states of uniform velocity at rest or uniform motion (Gamow, 1961, pp. 45, 46). It follows that if such observers could not distinguish between two uniform motions, then they could not tell whether or not they were moving through space. But the famous Michelson and Morley light experiment (Chapter 9) and many other similar light experiments paradoxically failed to detect any such absolute velocity. This failure created a crisis in physics and demanded an explanation. For all of the above reasons, during the score of years between 1885 and 1905, Galileo’s simple sensory and empirical principle of relativity underwent a dramatic theoretical and mathematical metamorphosis. It was first modified into an abstract “relativistic” concept of co-moving inertial reference frames by Ludwig Lange in 1885 (Chapter 13), and thereafter mathematically described and applied by what were called the “Galilean transformation equations”(Chapter 14). In 1904, Lorentz mathematically modified such Galilean transformation equations in a very radical way so that they became ad hoc Lorentz transformation equations, and Poincaré attempted ad hoc to generalize and apply Galileo’s complete concept of Relativity (including the inability of inertial observers to tell whether they were uniformly moving or at rest) to electromagnetics (the constant velocity of light) and optics as well as mechanics (see Chapter 16). In 1905, Einstein adopted Lorentz’s ad hoc transformation equations and Poincaré’s ad hoc concepts of relativity and modified, reinterpreted and applied them so that inter alia they described an impossible absolute propagation velocity of light at c, an impossible contraction of matter, an impossible dilation (expansion) of time, an ad hoc increase in mass with velocity, etc. Einstein asserted that he was merely reconciling Galileo’s mechanics concept of relativity with Maxwell’s concept for the constant velocity of light at c, in order to arrive at his Special Theory of Relativity. However, as we will demonstrate in later chapters, the radical principle of relativity that Einstein was referring to had nothing to do with Galileo’s simple sensory and empirical concept of relativity, nor with the algebraic version of relativity, nor with Maxwell’s concepts of light. By the time Einstein was through mathematically fiddling with Galileo’s Relativity, Galileo most likely would not have been able to recognize his own simplistic sensory and empirical concept. Not surprisingly, Galileo’s Relativity, the algebraic version of relativity, Lange’s Relativity, Lorentz’s Relativity, Poincaré’s Relativity, and Einstein’s Special Theory of Relativity are all very different concepts (see Memo 24.3). C. Is Galileo’s Relativity a fundamental law of nature? Galileo’s analogy in favor of the Copernican theory, that the observers in a closed cabin on a uniformly moving ship could not physically sense such motion and that the objects on such uniformly moving ship empirically accelerated in the same manner as when the ship was at rest in port (relative to the Earth), helped Galileo in 1632 to persuade others that the apparently stationary Earth might actually be moving. It remains an interesting phenomenon and relationship for purposes of discussion. However, such analogy was irrelevant to the rest of Galileo’s concepts of relativity and to the relative motions that they described. If the observers went up on deck they would sense the wind in their faces and see the boat moving relative to the water. If they looked through a telescope they would realize that the Earth was moving relative to the other planets. If they constructed a Foucault pendulum on board, they could observe the motion of the Earth around its axis. Thus, we must ask the question: Is Galileo’s Relativity even a fundamental law of motion? Because of the strict theoretical limitations (i.e. 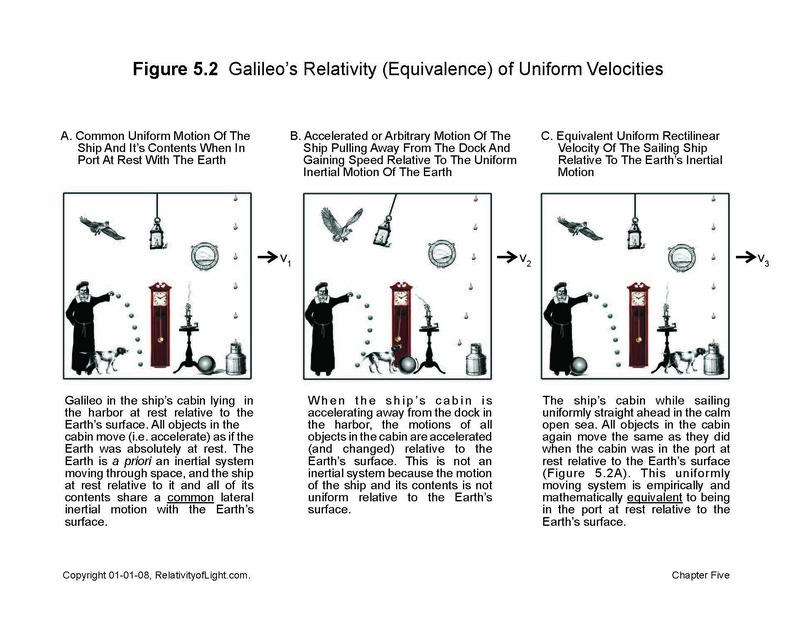 uniform rectilinear velocity) of Galileo’s Relativity, and because it substantially ignores the ubiquitous force of gravity, Galileo’s concept of relativity in any form is really just an approximation of reality and an impossible idealization. Even the Earth does not meet these strict requirements. Its surface is curved, its elliptical path around the Sun is curved and results from gravitational forces, and its elliptical velocity is not uniform. On Earth, the uniform velocity of terrestrial objects is only sustained by a continuous application of force; therefore, such velocity is not inertial. For these reasons, Galileo’s Relativity most likely does not even qualify as a fundamental law of mechanics, much less a fundamental law of physics or nature. If two trains accelerate unequally over the same circular track, are not their accelerated motions still covariant? Does not Newton’s second law of motion work the same way (covariantly and invariantly) with respect to each accelerating train even though their forced motions are not rectilinear nor of uniform velocity? Is not such forced circular accelerating motion of each train itself a demonstration of the invariance of Newton’s second law? If the track under each train is identically bumpy, do not the train’s resulting arbitrary and herky-jerky motions remain covariant? Does not Newton’s second law of motion hold its algebraic form and continue to work (covariantly) in exactly the same way on each train, albeit not as simply, elegantly or obviously as before? If a bazooka is fired from each herky-jerky train, will not each bazooka still exhibit identical equal and opposite actions and reactions (Newton’s third law)? Cannot modern sensors and computers sense, sort out and compute all of the above motions, their magnitudes and their trajectories…and thereby empirically demonstrate the covariance and invariance of Newton’s second law? From all of the above discussions, it becomes apparent that the 17th and 18th century mechanics concept of Galileo’s Relativity should not be characterized as a fundamental law of motion, much less a fundamental law of physics or nature. Nor should its mathematical counterparts, such as the Galilean transformation equations, or Lange’s, Lorentz’s or Einstein’s modified relativistic models of Galileo’s Relativity, be characterized as fundamental laws of motion. Although originally based on a fundamental law (inertia), Galileo’s concept of relativity remains just a sensory and empirical illusion of rest and a manmade convention that was convenient for early scientists as an intuitive theoretical demonstration of the empirical covariance and invariance of Newton’s second law of motion. Whatever their current relevance, Galileo’s original principle of relativity and its mathematical variations should be confined to the realm of mechanics. Contrary to the assertions of Poincaré and Einstein, the very different phenomena of electromagnetism, radiation, and the constant velocity of light in a vacuum have absolutely nothing to do with inertia, nor with the uniform rectilinear motions of matter, nor with the accelerated motions of matter, nor with mechanics, nor with material frames of reference, nor with coordinate transformation equations, nor with Galileo’s Relativity (Chapters 23 and 24).